Although not pertinent to a lot of enthusiast microscopists, this article might be of some help to new honey bee keepers extracting honey for the first time. I realise many bee keepers will own a microscope and some may do more with it then monitor the state of health of their bees. We started bee keeping roughly a year ago and after having to re-queen two hives and learning by mistakes we eventually reached a point where we could extract honey this month (June 2017). Like any first time experience, we suspected this was going to be less than straight forward. And we were right. We followed advice and when for extraction using a hand-cranked honey extractor. We opted for the next one up from the cheapest as this could hold four frames and being made of metal, promised to be a robust unit. We duly cut the capping from 4 frames, put them in the extractor and cranked the handle. Now if you have tried using one of these extractors, you will know the problem. As the spinning drum tries to pick up speed and balance itself around an absolute centre, the huge thing starts to walk across the floor and literally bang about in a very unstable and difficult to control manner. You might notice if you own one of these, that the legs can be bolted to the floor - an option we subsequently considered. But then we noticed advice in one of our bee keeping books. I have to say, I had seen this tip before and couldn't really see why it would work, but as I thought about it again, I got it! The solution is to bolt the extractor to a wooden T-section which has a caster wheel at the end of the leg of the wooden tee. (See photo below). Like me, you might not see how this can possibly solve the problem, so why does it? The extractor is a centrifuge which spins at a rate to propel the honey from the uncapped comb (after cutting the capping from the comb). Like any spinning device, everything has to balance itself about one turning point. What happens with the extractor on legs is that inertia forces tend to move the extractor this way or that as it seeks to balance its centre. Unfortunately, the legs do not slide but jump momentarily an inch or two, shifting the spinning whole's centre before it can find its balanced centre. This continues and the whole thing leaps around, forcing you to try and manually hold it in position like a kicking mule. The T-section on wheels allows the thing to move smoothly a little any way as the extractor centres up. I was amazed when I tried it. See video below. 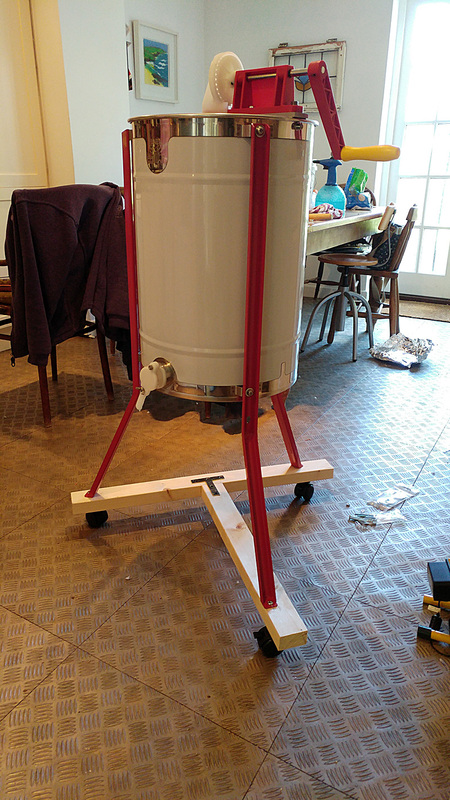 The whole cost of the wood, metal T brackets, bolts, and casters was less than £20.00 from B&Q, and the simple structure has now completely improved the honey extraction process. Use wing nuts to secure the bolts to enable easier dismantling for storing. Comment to the author Mol Smith are welcomed.